The 767 is one of my favourite aircrafts and is flown by Air Canada on various routes to relaxing destinations. The Boeing 767 had been completely absent from the X-Plane community until December 12, 2015 – the day FlightFactor released their 767-300ER passenger version. Finally, please note - for the purpose of this review, I am using a clean install of X-Plane 10. Which means, my scenery textures and cloud textures are ALL default to prevent any misunderstandings of the X-Plane 10 simulator itself. That being said, on with the review! 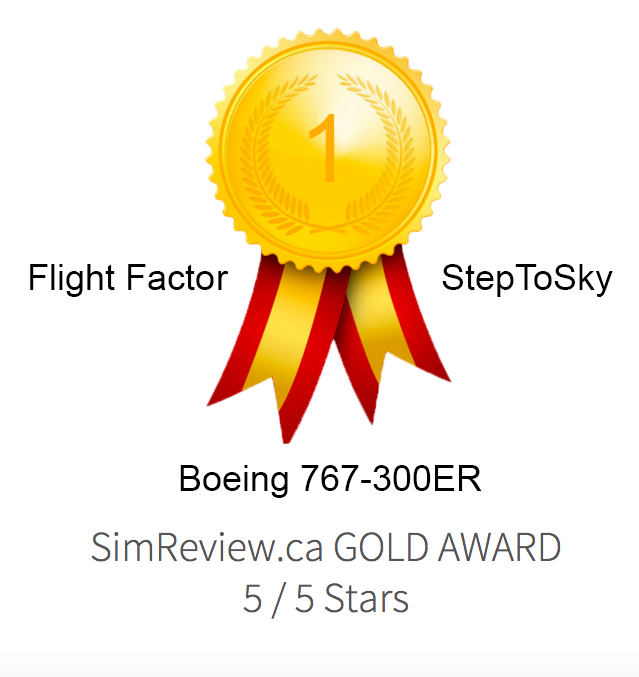 After purchase, I received a single .zip file containing the FlightFactor & StepToSky 767-300ER. All I had to do was open up my X-Plane 10 folder, browse to Aircraft, then Heavy Metal, and drop the unzipped 767 folder inside. Start up X-Plane 10.42 and it loads perfectly. On the AVSIM forums, I’ve seen numerous discussions about how the FlightFactor 757 and 767 cockpit modeling & graphics differ. Let me tell you off the bat that I, along with the numerous other simmers who purchased this 767 on release day, have found that the 767 is a completely new experience. Think back to when PMDG released the 737NGX and how that cockpit differed from their old FS9 737. I had that exact same feeling when I hopped into the cockpit of this new 767: it was honestly a brand new experience seeing that cockpit for the first time and getting blown away by the incredible amounts of detail put into this product. Aside from the standby attitude indicator, every single display, whether it be computerized (PFD, ND, EICAS) or mechanical, look exactly like the real display(s) and have graphics sharp as ever. Here, have a look and tell me, doesn't that just look amazing? Note how sharp those textures look, especially on the PFD and ND. And here’s a more zoomed in view on that 3rd screenshot from above. (or also known as the view from my seat!) Notice how detailed everything looks. To configure cockpit avionics, turn off dynamic closing window blinds, add/remove winglets… etc, FlightFactor has included a simulated version of an iPad, running a Boeing software that I would assume looks similar to a Boeing iPad EFB. Let's look at the first page. It contains the general configuration settings for this aircraft. This next page, titled "ground" (shown below), shows an array of options to simulate ground operations. As you can see from my screenshot below, I've the aircraft connected to ground power, refuelling, and with the wheel chocks in place. I also have the air conditioning unit connected so the passengers don't freeze in the back. The coolest option here is the live configuration of the aircraft; most addons for FSX/P3D came with external software that injected these payload/fuel configurations, and you had to fill it out before starting FSX/P3D. Now, in X-Plane 10, I can just use this iPad simulator to set these configurations in-sim. I think that is really really cool, and is like something you'd find in a professional sim. You can also call the pushback truck, which I'll get to once we're ready for pushback later in this review. Next up is the page where you can enable/disable the dynamic blinds; in previous FlightFactor aircraft, the passenger blinds automatically open/shut to simulate passengers, but some people wanted them to be configurable. Guess what? FlightFactor listened to this suggestion and made an option in the iPad simulator to turn off dynamic blinds. You can also configure whether or not the aircraft has winglets. As for the wingflex, reflections, and cockpit effects, they're all adjustable. They differ f or every PC, so I just left them at 50% for the purpose of this screenshot. One more screenshot is the avionics tab. This is pretty much the "customer options" page from Boeing as a company orders a 767. Here you can set the company options of the systems and displays. Anyways, let’s do our flows and setup the FMC for departure so we don't keep the passengers waiting. We’ll be doing a BANGR7 SID out of Seattle, taking runway 16L due to the weather this morning. Ok, the passengers are on board, baggage loading complete, and refueling complete. Time to push back, start the engines, and be on our way down to the city that reaches high 20+ degrees Celsius in the wintertime. Here’s one of the many things you don’t see in FSX/P3D, but only in X-Plane: the pushback truck actually lifts the nosewheel when it attaches to the aircraft and you can see it actually lifting the aircraft up a few centimeters if you zoom in enough. The pushback truck works like this: you steer your own pushback and control your own pushback speed. In my case, all I do is advance my hardware throttles forward and the pushback begins. As I come closer to the taxiway, I start to twist my joystick – which is what I’m using for a tiller – and the pushback steers the aircraft in the direction I’m twisting my joystick. (I have a yoke to fly the aircraft with). As pushback is complete, parking brakes are set and the truck can be disconnected with the same iPad screen. Notice how there’s an “auto” button near the top right – clicking it will automatically complete the checklist and automatically move switches around the cockpit – simulating as if a First Officer just went through that checklist. If you want to do everything yourself, simply just complete the checklist item and click the “check” button on the bottom. This electronic checklist is similar to one you’d see built into the 777. With all procedures complete, it’s time to taxi to the runway. As we head further away from the terminal, the First Officer puts on his weather radar while I have my terrain on the ND, as it is a mountainous airport. Notice how you can have both on at once… One thing I really enjoy about this TERR mode is the "peaks mode", allowing me to have situational awareness even if I'm at a high altitude. Because of the rain, the amount of accumulated raindrops on the windshild is blinding us, so I turn on the wipers. The raindrop and wiper simulation works as well! Now it gives me a reason to turn on wipers in the rain, whereas in FSX/P3D addons, having them on/off doesn't make a different. Well, in X-Plane 10 it does! Note the area below the wipers is clean, while the area above is filled with accumulated raindrops. Takeoff! Thrust Set. 80 knots. V1. Rotate. V2. Positive rate, gear up! Here’s a quick capture of this gem as we climb through the rainy skies of Seattle. As our SID takes us toward the ocean, my weather radar goes on as well to dodge a few CBs. The cruise phase went through very smoothly. I even had the chance to unlock the flight deck door, and step into the cabin to take a look at the situation in the back. Unfortunately, I had forgotten to take a few screenshots. I guess it works well, as I’m sure none of the passengers want their photo taken. After a quick scan around the back, I re-enter the cockpit to prep the aircraft for descend. The VNAV takes over at the top of descend, and our aircraft slowly starts descending into the warm skies of California. One thing I found to be very strange was how I cannot select the arrival runway first, and STAR second. I had to select the STAR first, runway second, on the FMC DEP/ARR page. According to FlightFactor, this is accurate, but from other Boeings, it can be done both ways. Perhaps if anyone has real world experience on the 767, please private message me and let me know! Handflying this aircraft was an absolute joy. I disconnected the autopilot at 5000 feet and handflew the entire approach into LAX. The aircraft responded really well to small inputs and I had a good rate of descend and touchdown! She flies beautifully. Unfortunately, I had forgotten to quickly snap some screenshots of the landing, as it was only my 3rd time handling this new gem in XP10. However, I'll leave you with some gate screenshots below. I fully recommend this addon to everyone – it is pretty much a PMDG level simulation of the 767. The only things I can think of that aren’t planned to be simulated are the circuit breakers. Aside from that, this aircraft pretty much as everything. And compared to the 757, this 767 is, like I said in the beginning, a whole new product and a whole new experience. The graphics on the displays look exactly like the real aircraft and the systems behave as I expected, coming from experience working with professional simulator avionics. This aircraft is my new #1 favourite in my X-Plane 10 hangar.